Hello Fitness World! I was recently approached through instagram by a nice lady from Ambronite, and I was intrigued by the information I found on their website. Ambronite is an organic drinkable supermeal that contains 18 organic ingredients, it is vegan, GMO free, and contains no artifical flavourings and preservatives. Even more intriguing, the drink keeps you full for 4-5 hours! It has also been featured on Times and Business Insider, and after reading both of these articles, I just had to find out more. I was fortunate enough to get a free box to sample (thank you so much Ambronite! ), and I'm glad I did! So, here is my Ambronite review. 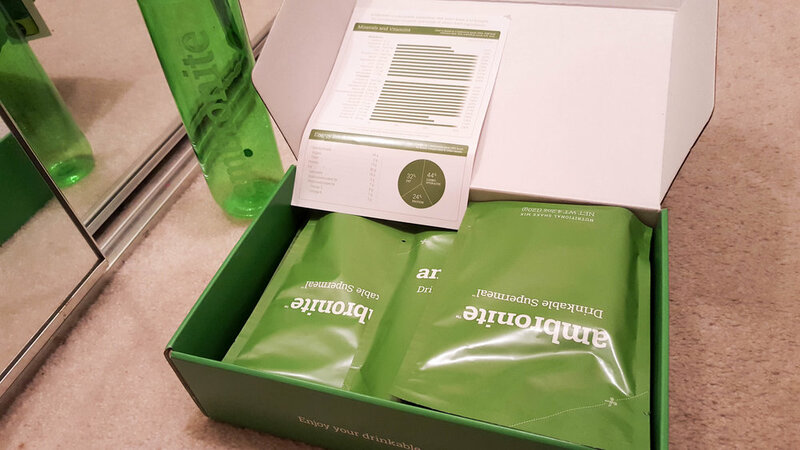 Looking at Ambronite's nutritional label, the first thing that stood out to me was the eye popping 500 calories! This is a total meal replacement and that 500 calories looks like it can come in very useful. Again, one has to look at this objectively and understand your own goals. I am used to much lower calorie shakes. My goals are portion control, fat loss, and strength gain. As you know I make no excuses, but if I did: ice cream! If I needed a convenient meal for all day activities like: hiking, beach bumming, trips with no restaurants in sight, etc, this would definitely be a good option for me. Now let me get to the important part. The taste is not super sweet like most shakes. I dislike that artificial sweet taste that most shakes seem to have. The actual flavor is rather understated and pleasant (I mixed mine with water). This might sound weird, but it tastes organic. There is a nutty/grainy flavor that I liked. The consistency is rather thick, but not so thick that it feels like you are drinking oatmeal. Some shakes these days seem to have micronized particles and you can feel it like super tiny grains of sand, Ambronite is the opposite. When you mix it, it can get clumpy, but mixes decently well enough without using a blender. I am not so much pro-organic as I am anti-processed. Some processing is fine, just too much processing starts making things unhealthy and hard for your body to digest and absorb. I like how this shake has excellent ingredients. The clean and natural idea translated well into the product. Lastly, for my personal thoughts. I could not drink Ambronite in one sitting. It was really filling and like I said earlier, I am used to much lower calorie shakes. My goals are different, therefore this is just an observation more for my specific situation. The protein/carb/fat grams are 30/54/18. That is a lot of carbs for me! As I am on a fat loss phase, I like my protein macros to be much higher in ratio. Again, if a specific situation arises, Ambronite can definitely fit the bill. The best part about the shake is absolutely how clean and 'real' it feels. It is hard to describe. You know when you drink a shake and you know it isn't real food, but something that tides you over? This shake feels like you are having a meal of oatmeal (in a good way!). I highly recommend this to people who want to eat healthier. For people who are looking to lose fat and are working to clean up what they eat, I suggest to replace a meal or two with Ambronite. Alternatively, if you are trying to bulk up or feel like you are too busy to eat and/or do all day activities, this shake is also a good choice for you. Not all proteins, carbs, and fats are created equal. While I am no nuclear physicist (what do you think I am, a nerd? ), the high amount of carbs and fat from Ambronite seem great to me. They are from great, mostly organic ingredients like almonds, coconut, flax seeds, spinach, brazil nuts, etc. Gluten is fine, however while I do not have celiac disease, I do have a gluten sensitivity (I got a blood test and can prove it!!!). I avoid gluten whenever I can and my guess is that this product contains gluten. Again, not a deal breaker (like a guy who takes more selfies than I do), but something to be aware of. Esther aka No Excuse Girl....Ice cream. Cry.